We live in dark times… affluence makes usfat,there is always a newer smartphone coming out… No wonderthesuicide rates are going through the roof. And your job is tocatchthe jumpers from there! Can you handle the most depressinggame inthe Store? Quickly move your trampoline left or right to save as many peopleaspossible! Play with increasing difficulty in "Endless Suicide" or catchasmany as you can out of 100 in "Sudden Suicide"! Tap different power ups to make your job easier! Sad music will bring you to tears! If you want to get rid of your annoyingly good mood, this isthegame for you! 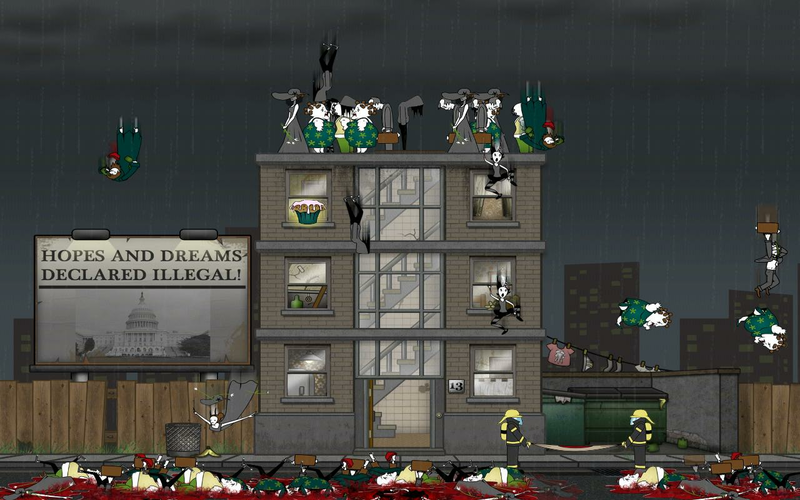 Street Huggers is a dark satirical rescue game that requiresgoodreflexes! Control your rescue team with your finger (or anyotherpart of your body. Who are we to decide?) Two different gamemodes,leaderboards and temporary power ups will keep youentertained andfeeling a little guilty about it! For news about Street Huggers and our other games, visit usonour homepage and Facebook! Sheep-shearing is boring? Try sheep-blasting! How far can you go?Adjust the cannon and press the big, fat red button and watchthe cute little sheep take off! We live in dark times… affluence makes us fat, there is always anewer smartphone coming out… No wonder the suicide rates are goingthrough the roof. And your job is to catch the jumpers from there!Can you handle the most depressing game in the Store? ---------- ☆ FAST PACED GAMEPLAY! Quickly move your trampoline left or rightto save as many people as possible! ☆ 2 GAME MODES! 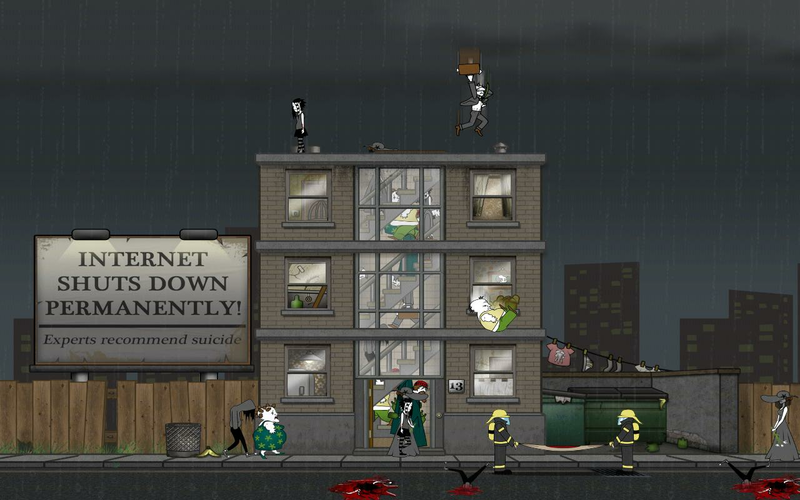 Play withincreasing difficulty in "Endless Suicide" or catch as many as youcan out of 100 in "Sudden Suicide"! ☆ LITTLE HELPERS Tap differentpower ups to make your job easier! ☆ CLASSICAL MUSIC SCORE Sadmusic will bring you to tears! ☆ GUARANTEED DEPRESSION! If you wantto get rid of your annoyingly good mood, this is the game for you!---------- Street Huggers is a dark satirical rescue game thatrequires good reflexes! Control your rescue team with your finger(or any other part of your body. Who are we to decide?) Twodifferent game modes, leaderboards and temporary power ups willkeep you entertained and feeling a little guilty about it! ---------- For news about Street Huggers and our other games,visit us on our homepage and Facebook! Create your very own crazy zombies with thisawesome app on your Android device for free!☆ Choose from the included backgrounds, bodies, clothes, eyes,hairstyles, heads, pair of legs and mouths to create your very ownzombie!☆ Create literally millions and millions of unique zombies andunleash them by email or share them on Twitter or Facebook –directly from the app!☆ Add even more awesome parts and items and support ‘Make AZombie’ with the integrated zombie store.☆ Regular updates with free parts for even more unique zombiecombinations!☆ Make sure to leave a comment with your ideas and wishes forfuture zombie packs in your review!☆ If you experience difficulties on your phone, please let usknow!☆ Follow us on twitter.com/SkunkBrothers to stay in touch withus! ☆ FAST PACED GAMEPLAY!Quickly move your trampoline left or right to save as many peopleaspossible! ☆ 2 GAME MODES!Play with increasing difficulty in "Endless Suicide" or catchasmany as you can out of 100 in "Sudden Suicide"! ☆ LITTLE HELPERSTap different power ups to make your job easier! ☆ CLASSICAL MUSIC SCORESad music will bring you to tears!☆ GUARANTEED DEPRESSION!If you want to get rid of your annoyingly good mood, this isthegame for you!----------Street Huggers is a dark satirical rescue game that requiresgoodreflexes! Control your rescue team with your finger (or anyotherpart of your body. Who are we to decide?) Two different gamemodes,leaderboards and temporary power ups will keep youentertained andfeeling a little guilty about it! ----------For news about Street Huggers and our other games, visit usonour homepage and Facebook! Suicide Block: An infinite runner in 2D.Update Blogs can be foundat our website.Crash course: - You're a small cube. And you have totry getting as far as you can, by jumping over spikes. (Don't getcrushed into the blocks either) - Tap the screen to start and/orjump. - Pause button in the upper left corner of the screen. - Backand Mute buttons in the upper left corner of the screen.Incase offinding a Bug and/or Glitch: - If you find a bug and/or Glitch.Please do send a mail to [email protected] , And we'll take alook. How High Can You Die?DISCLAIMER: this game is hard.Fast paced, Tiltcontrolled urban skydiving action!Avoid obstacles such asinconspicuous pipes, random girders and useless cranes while infree fall down the side of the tallest building in theuniverse.Wearing nothing but a tea towel to enhance youraerodynamic maneuverability, take the plunge and see how long youcan last!PLEASE NOTE:this game is in early stages of release, theremay still be bugs present or features that need tweaking.If youcome across anything that needs fixing, let us know!Copyright -2014'We Beat The Dragon'Steven GraysonIan CrossanSpecial thanks, JamesGrayson!